For those who have been visiting me for a while on ZoeBakes, you may remember my first Ice Cream Cake post; a dedication to my two brothers. Well, almost 4 years later and I’m still making them ice cream cakes for their birthdays, some traditions are just worth repeating. 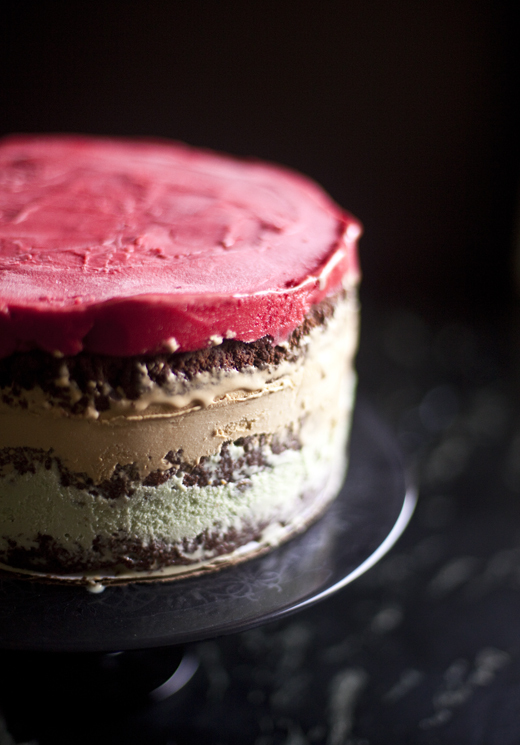 This cake was done in exactly the same way, but the ice cream flavors are different and I added a layer of sorbet. This cake couldn’t be easier or tastier, and it’s well suited to the little boys my brothers were when I started this tradition and for the great men they have become. 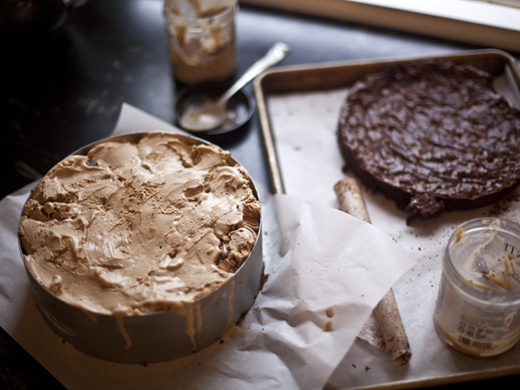 Follow the directions for the outrageously decadent brownie and how to assemble the cake here. 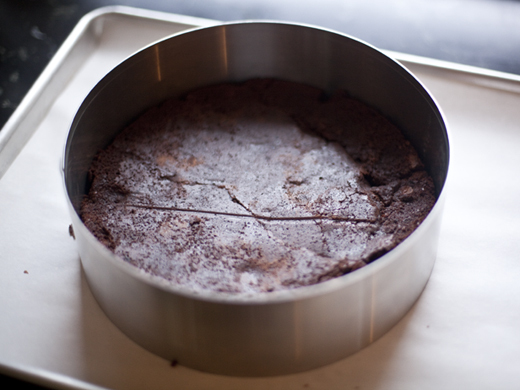 Don’t be tempted to bake the brownies any thicker or the cake becomes difficult to cut. I learned this the hard way! Pick any ice cream and/or sorbet you like. The higher quality (Ben&Jerry’s is a good example) tend to freeze harder and make it easier to cut the cake. Soft ice cream tends to want to mush out the sides. I learned this the hard way too! You can also make your own Ice Cream and Sorbet, but leave yourself extra time. 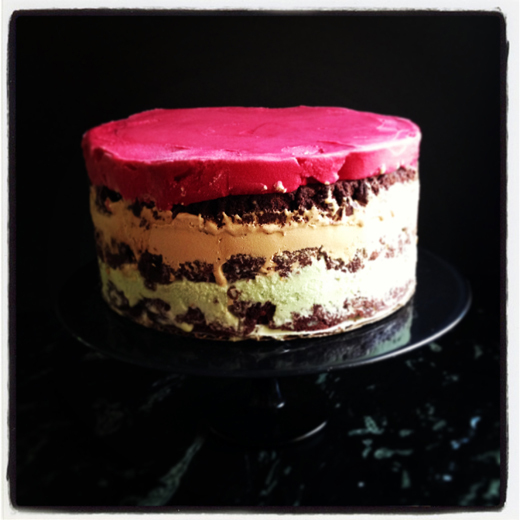 I used Pistachio and Salted Caramel for the first two layers and then topped it with the bright red raspberry sorbet. You can use a springform pan or a cake ring. If your cake layers go beyond the top, you can use this clever plastic band or double up foil and create a collar around the mold. 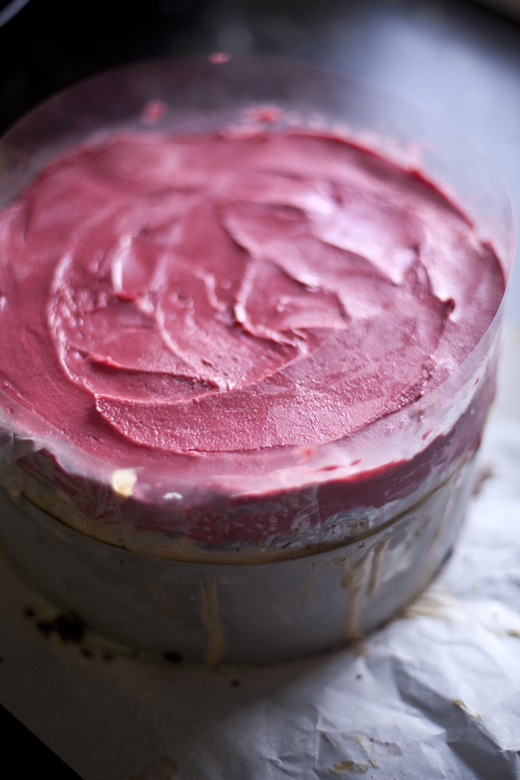 Make sure you give the assembled cake at least 12 hours to freeze, to make sure all the ice cream is solid. You guessed it, I learned this the hard way. Not a cake to assemble just a few hours before the party. And it would make a great Father’s Day dessert. So pretty, love the sorbet layer! Looks so pretty and delicious! What flavors did you use? Hi all! I just added the flavors to the post. Silly me forgot the best part! Oooh…this is simply too good. I was thinking of an icecream as my little boys b’day is coming up soon and a summer b’day deserves an icecream cake right? 😉 I was thinking of mango icecream and vanilla cake…yours looks yumm and pretty, what a lovely tradition! Mmm homemade ice cream cake is the best! What a great idea and so colorful and fun. You’d almost hate to eat it. Great tips. I’ll have to try one for my kids upcoming birthdays. Thanks for sharing. Thanks Zoe as always!! I like ice cream cakes for spring/ summer, so I will keep this one for the birthdays in October (here in Australia we are now in winter). Your ice cream cake look very yummy!! a real delight. 1 more piece in the freezer to finish. Each layer is a different experience. Looks great. Im trying this soon. Thanks Zoe!!!! I’m a HUGE fan of ice cream cake, it’s probably my favorite dessert. I would eat this one in a heart beat! Probably the entire thing. In one sitting. Oh this is perfect timing, just at the beginning of summer. Thanks so much for learning the hard way, your tips seriously save me the grief 🙂 Adding pecans is what my family really likes. Love this! So pretty…basically I am thinking every single one of my favorite flavors can get in there. No compromises!